Home Place Yo Yo Mat, by Park Designs. The Home Place collection features a black, barn red, and cream tiny plaid, with an embroidered and appliqued saltbox house on some of the pieces. This is for the Yo Yo Mat. Measures 10 inches. 100% cotton. Other items in the collection also available! Home Sweet Home Pitcher, by Park Designs. 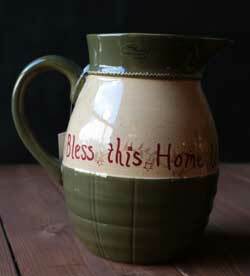 This homey picture is a warm green with hand painted sentiment that reads: "Bless this home with love and laughter." 72 ounce capacity. This acorn-shaped mat makes a perfect fall decor centerpiece! Just add a candlescape and your table is ready for thanksgiving! 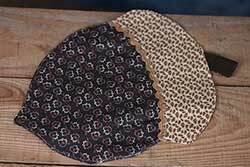 Indian Summer Pocket Pot Holder Set, by Park Designs. 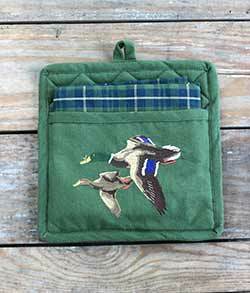 Includes a green waffle weave dishtowel tucked into an embroidered and appliqued pot holder. Measures 9 x 9 inches. 100% cotton. Other pieces also available! The Indian Summer Collection is inspired by fall leaves, Indian corn, warm days and crisp nights, and a palette of browns, sage, cream, and persimmon red. This is for the 36 inch Tablerunner. Indian Summer Tablerunner, by Park Designs. The Indian Summer collection features a warm, harvest-inspired palette of brown, cream, sap green, barn red, and gold tones in a patchwork pattern. Great for fall or everyday! This is for the Tablerunner. Measures 13 x 54 inches. 100% cotton. Other colleciton items also available! Iron Crow, by Park Designs. Measures 12 x 10.25 inches. 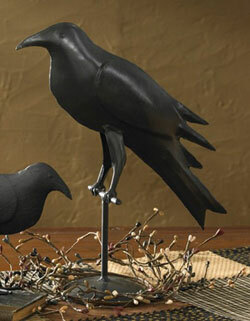 Made of iron that is powder-coated black. Photo courtesy of Park Designs. Java Napkin, by Park Designs. 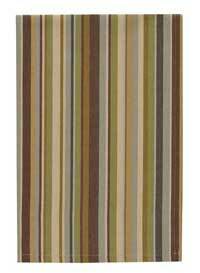 The Java Collection is a striped pattern of warm, coffee-house type colors of persimmon red, dijon yellow, sap green, plum, vanilla, and chocolate. This is for the Napkin. Measures 18 x 18 inches. 100% cotton. Other items in collection also available! Java Placemat, by Park Designs. The Java Collection is a striped pattern of warm, coffee-house type colors of persimmon red, dijon yellow, sap green, plum, vanilla, and chocolate. This is for the Placemat, which is woven and nicely textured. Measures 13 x 19 inches. 100% cotton. Other items in collection also available! 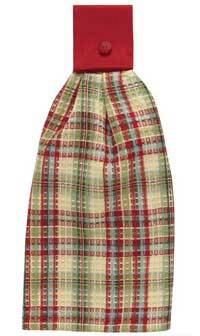 Jingle Bells Hand Towel, by Park Designs. The Jingle Bells Collection features a beautiful winter plaid in soft hues of cream, celery green, pale blue, and cranberry red. This is for the Hand Towel, which is waffle weave style, with a buttoned hanging loop. 100% cotton. Machine washable. Other coordinating linens also available! The Jingle Bells Collection features a beautiful winter plaid in soft hues of cream, celery green, pale blue, and cranberry red. This is for the Placemat. Jingle Bells Pot Holder, by Park Designs. The Jingle Bells Collection features a beautiful winter plaid in soft hues of cream, celery green, pale blue, and cranberry red. This is for the Pot Holder. Measures 8 x 8 inches. 100% cotton. Other coordinating linens also available! Jingle Bells Tablerunner, by Park Designs. The Jingle Bells Collection features a beautiful winter plaid in soft hues of cream, celery green, pale blue, and cranberry red. 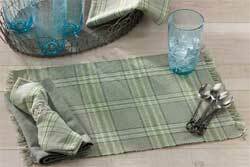 This is for the Tablerunner, which is ribbed-style, with fringe on each end. Measures 13 x 36 inches. 100% cotton. Machine washable. Other coordinating linens also available! Lake House Dishtowel, by Park Designs. The Lake House Collection features a striped pattern in a palette of watery blues, cattail browns, and driftwood grays. This is for the Dishtowel. Measures 18 x 28 inches. 100% cotton, machine washable. Other items in collection also available! Made of stoneware. This is for the Canister, in the largest size. 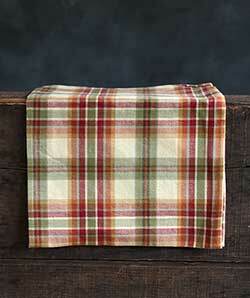 This beautiful new collection features a plaid of rustic red, olive green, and mustard yellow. This is for the dishtowel. Lemon Pepper Napkin, by Park Designs. 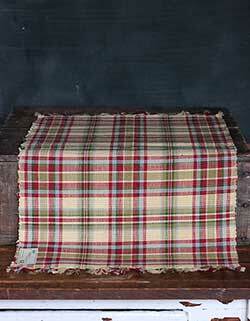 This beautiful pattern features a plaid of rustic red, olive green, and mustard yellow. This is for the Napkin. Measures 20 x 20 inches. One of our longest-standing and most popular patterns! 100% cotton, machine washable. Other coordinating linens also available! Lemon Pepper Valance, by Park Designs. 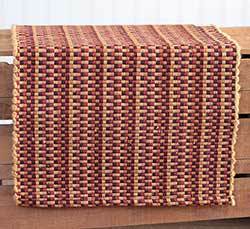 This beautiful pattern features a plaid of rustic red, olive green, and mustard yellow. This is for the Valance. One of our longest-standing and most popular patterns! Measures 16 x 72 inches, with a 1.5 inch header and 2 inch rod pocket. Lined. 100% cotton. Other coordinating linens also available! Lemongrass Napkin, by Park Designs. 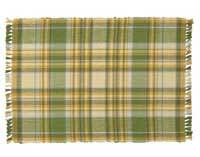 The Lemongrass Collection is a plaid of lemon yellow, soft lime green, and ivory, with a tiny touch of light blue. This is for the Napkin. Measures 18 x 18 inches. 100% cotton, machine washable. Other items in collection also available! Lemongrass Placemat, by Park Designs. The Lemongrass Collection is a plaid of lemon yellow, soft lime green, and ivory, with a tiny touch of light blue. This is for the ribbed Placemat, which has fringe on each side. Measures 13 x 19 inches. 100% cotton, machine washable. Other items in collection also available! The Lemongrass Collection is a plaid of lemon yellow, soft lime green, and ivory, with a tiny touch of light blue. This is for the Tablecloth, in the 54 x 54 inch size. 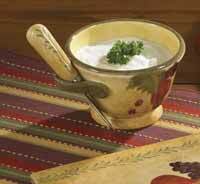 Madeira Dip Bowl & Spreader Set, by Park Designs. 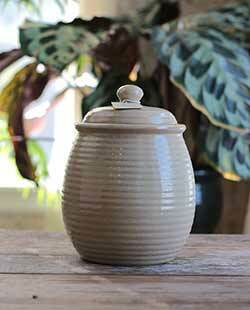 Beautiful hand-painted ceramic pottery, the color of Italian stucco, with rim and painted vine border in soft green. Some accessories feature painted fruit. Available in full place settings, open stock pieces, and accessories. This is for the Dip Bowl & Spreader Set. Measures 2.75 x 5.25 x 4.5 (Bowl) and 5.25 inches (Spreader). Madeira Salad Plate with Grapes and Pears, by Park Designs. 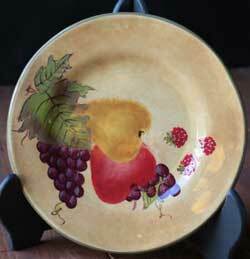 A beautiful accent for your tuscan kitchen or fall decor, this hand painted plate features grapes, pears, and berries painted against a stucco-like cream/gold background, the green rim. The Black Watch Collection is fashioned after the tradition Scottish tartan of black, midnight blue, grassy green, and a bit of creme. 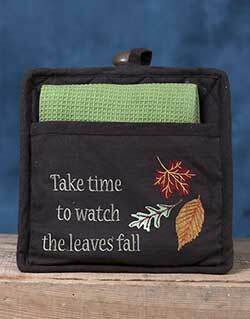 This is for the Pocket Pot Holder Set. 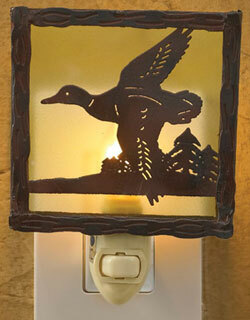 Mallard Nightlight, by Park Designs. This night features frosted glass window and metal flying mallard duck shape. Measures 5 1/4" H x 4" W x 2" D (inches). Includes the light bulb (5 watt). Other colors and styles available! Manchester Placemat, by Park Designs. The Manchester Collection features a warm pattern of barn red, rosemary green, and touches of golden mustard and cream. This is for the ribbed Placemat. Measures 13 x 19 inches. 100% cotton. Machine washable, see label for care instructions. Market Basket, by Park Designs. 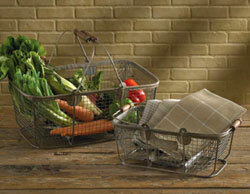 Sold individually from the two in photo - Choose the Smaller or Larger basket. 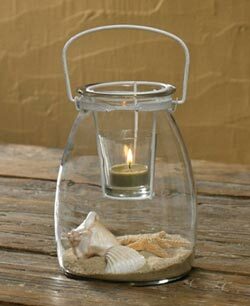 Use to display market produce, magazines, linens, etc. Larger one measures 7.5 x 18 x 11.75 inches, Smaller one measures 6 x 14 x 9 inches. Made of metal. Merry & Bright Hand Towel, by Park Designs. This hand towel is embroidered with the holiday phrase: "May your days be merry and bright." 100% cotton. Machine washable. Other coordinating linens also available! 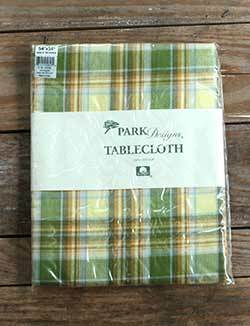 Merry Christmas Tablecloth, by Park Designs. The Merry Christmas Collection features a gorgeous collection of homespun fabrics in reds and greens. This is for the Tablecloth. Measures 54 x 54 inches. 100% cotton, machine washable. Matching linens also available! Coordinates beautifully with Holly ceramic pottery! Millbury Napkin, by Park Designs. 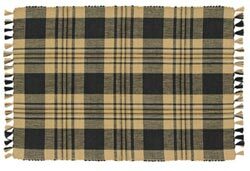 The Millbury Collection features a homey plaid of black and toasty cream. This is for the Napkin. Measures 18 x 18 inches. 100% cotton, machine washable (see label for care instructions). Other matching linens available. 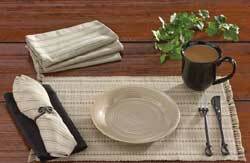 Coordinates beautifully with the Star Vine dinnerware collections! Millbury Placemat, by Park Designs. 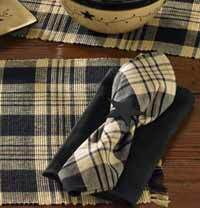 The Millbury Collection features a homey plaid of black and toasty cream. This is for the ribbed Placemat. Measures 13 x 19 inches. 100% cotton, machine washable (see label for care instructions). Other matching linens available. Coordinates beautifully with the Star Vine dinnerware collections! Millstone Dishtowel, by Park Designs. The Millstone Collection features a neutral color palette of cream, black, and oatmeal. This is for the Dishtowel. Measures 28 x 19 inches. 100% cotton. Other items in collection available! Shown with Blackstone and Sandstone Ceramics. Millstone Hand Towel, by Park Designs. The Millstone Collection features a neutral color palette of cream, black, and oatmeal. 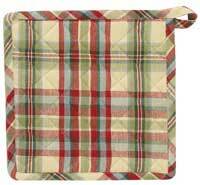 This is for the Hand Towel, which features a waffle weave dishtowel with buttoned tab top for hanging. 100% cotton. Other items in collection available! Shown with Blackstone and Sandstone Ceramics. Millstone Napkin, by Park Designs. The Millstone Collection features a neutral color palette of cream, black, and oatmeal. This is for the Napkin. Measures 18 x 18 inches. 100% cotton. Other items in collection available! Shown with Blackstone and Sandstone Ceramics. Mirage Dishcloth, by Park Designs. The Mirage Collection features a large plaid pattern in a soft palette of chocolate brown, creme, light blue, and leaf greens against a neutral grey background. This is for the Dishcloth, which is waffle weave style. Measures approx 13 x 13 inches. 100% cotton. Other items in the collection also available! 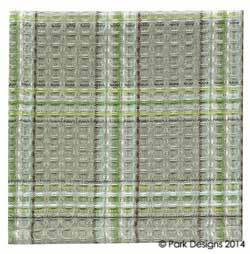 Mirage Grey Plaid Kitchen Towel, by Park Designs. 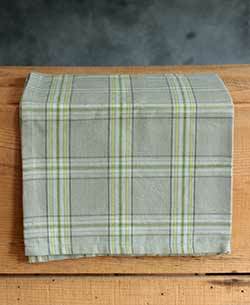 Beautify your kitchen with this pretty cotton towel, which has a woven plaid pattern in a soothing palette of chocolate brown, creme, light blue, and leaf greens against a neutral grey background. Measures 18 x 28 inches. 100% cotton. Mirage Hand Towel, by Park Designs. The Mirage Collection features a large plaid pattern in a soft palette of chocolate brown, creme, light blue, and leaf greens against a neutral grey background. This is for the Hand Towel, which is waffle weave style with a tab top for hanging. 100% cotton. Other items in the collection also available! Mirage Placemat, by Park Designs. The Mirage Collection features a large plaid pattern in a soft palette of chocolate brown, creme, light blue, and leaf greens against a neutral grey background. 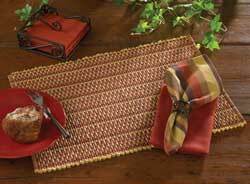 This is for the Placemat, which is woven with a small row of fringe on each end. Measures 13 x 19 inches. 100% cotton. Other items in the collection also available! Mirage Pot Holder, by Park Designs. The Mirage Collection features a large plaid pattern in a soft palette of chocolate brown, creme, light blue, and leaf greens against a neutral grey background. This is for the Pot Holder. Measures 8 x 8 inches. 100% cotton. Other items in the collection also available!